It’s time for more selected lists nominees! Stay tuned to the Hub as we reveal the nominees for 2019’s Quick Picks, Amazing Audiobooks, Great Graphic Novels for Teens, and Best Fiction for Young Adults! 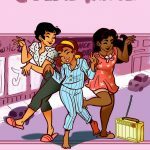 Today you can see our first three Great Graphic Novels for Teens 2019 (#GGN2019) nominees. Amina’s family now lives in Canada, but they fled Syria four years earlier after their home was destroyed. The reader sees Amina and her family’s journey from Syria to neighboring Lebanon, and later through Europe until finally her family arrives in Canada. 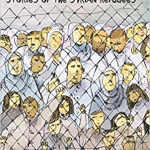 This story provides the reader with relevant historical information about the events leading up to the Syrian civil war and explains some of the underlying tensions between Syria and Lebanon. In addition, it explores the difficult choices refugees must make about announcing residence and working with smugglers. The use of grim colors in both the refugee camps and in Canada underscores the scope and scale of these issues. 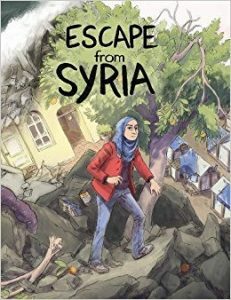 Hand to readers who want to learn more about current affairs or who were captivated by Refugee by Alan Gratz or Escape from Aleppo by N.H. Senzai. Claudia Jones is missing. Her classmates come up with wild and crazy theories. Could it be an alien abduction? But beyond theorizing, they barely notice their classmate’s disappearance. They’re too wrapped up in their own lives. We follow four classmates as they deal with difficult friendships, life changing surprises, summer jobs, and unrequited love. This book explores the complex issues that can come up during the teenage years. Changing friendship dynamics, unexpected pregnancy, romantic rejection, domestic violence, and taking care of unstable parents are all featured prominently in the lives of the four main characters. The illustrations shift to perfectly compliment the story as the tone moves between light and wacky to serious. 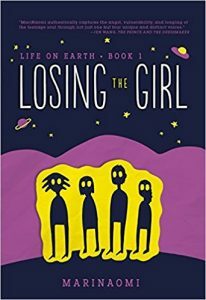 Hand to fans of fast-paced, angst-filled graphic novels, or those who enjoyed This One Summer, and authors Raina Telgemeier and Hope Larson. Pig has an important job to do, if only somebody else understood how difficult and important it is. Since his father’s disappearance, it’s been up to Pig and Pig alone to keep the darkness of the fog away from his town. However, the fog seems to be coming back stronger and more vengeful each time Pig attempts to keep it away. 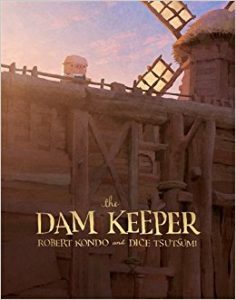 This book captures a visually arresting universe with darkness at its literal and metaphorical edges, and the art plays up the light/dark play to great effect, like eerily backlit scenes contrasted with a mysterious, foreboding fog. Readers get a story of Pig’s anguish over both the responsibilities that have been left to him and his fear of the unknown. This title will appeal to readers who enjoy dark fantasies like The Adventures of John Blake, where kids end up having to take on adult responsibilities. 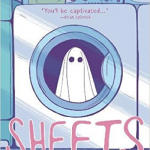 Great Graphic Novels for Teens Blogging Team @ YALSA's The Hub.